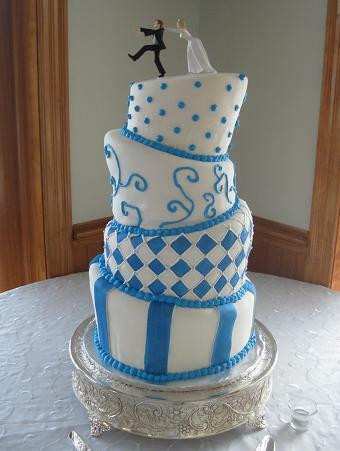 Whimsical wedding cakes, or topsy turvy cakes, make a fun and exciting cake centerpiece. Most people think it’s about to fall over, but when built right it’s really very stable. Email Steph about whimsical wedding cakes here! 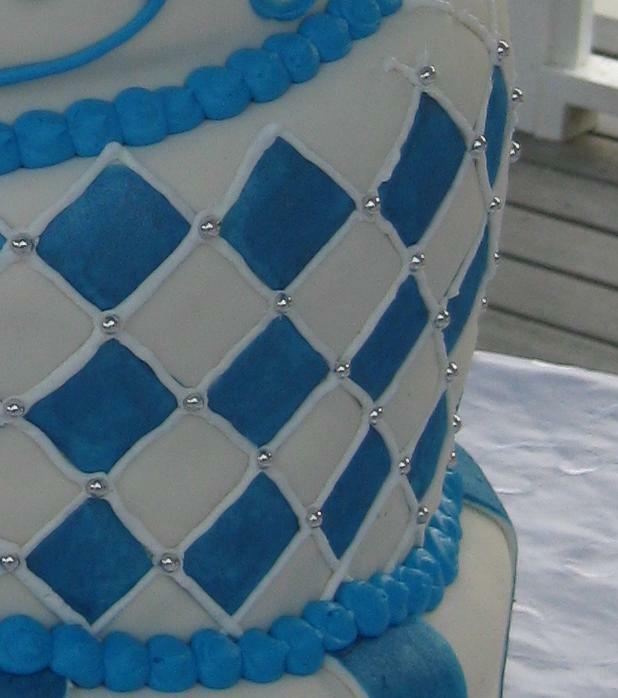 Put your traditional, elegant, modern, or whimsical style and personality into your wedding cake by using colored fondants, fillings, icing, toppers, and candy melts to make a unique and custom design, just for you. 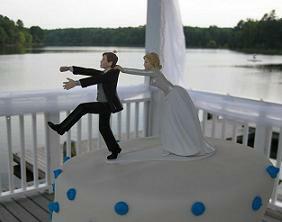 This was a perfect choice out of the whimsical wedding cake toppers. It perfectly matched the whimsical wedding theme. It’s OK to mix and match flavors and fillings, icings and frostings to make sure everyone has a piece-a-cake they will enjoy, and remember! This whimsical wedding cakes design was the inspiration of the bride to be, Velvet. 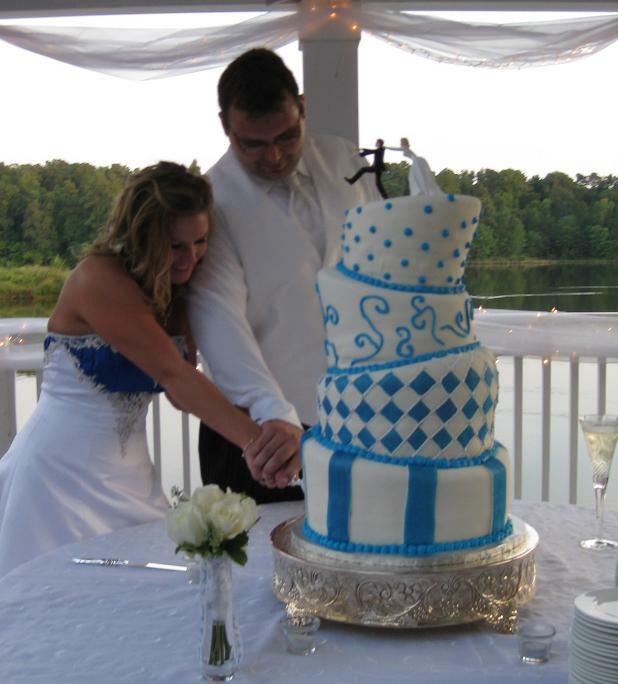 Velvet and Justin are from Raleigh and planned a beautiful wedding at Bass Lake in Holly Springs, NC. They also invited me to stay and cut/serve the wedding cake! 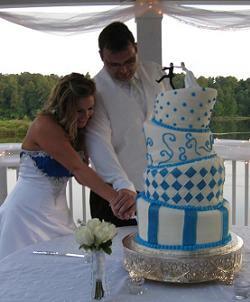 The cake flavors were vanilla, marble, yellow, and blue velvet all with buttercream icing. I used hand made marshmallow fondant to cover and decorate the whimsical look. Thank you so much Velvet and Justin for letting my wonderful helper, Jaime and me be apart of your special evening and it was beautiful! I wish you two all the happiness in the world, you are certainly wonderful people! 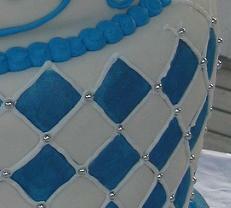 The blue accents were painted with edible luster dust and silver dragees. There was a lot of detail on the tier with the silver dragees. Click on the picture to zoom in for a closer look. Also ordered by Velvet as a surprise for Justin was his xbox cake. 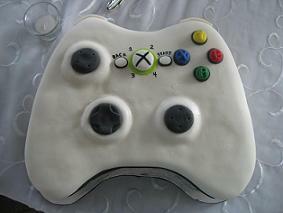 His xbox groom’s cake was lemon flavor with a lemon mousse filling. It was covered and decorated with hand made marshmallow fondant and had a working (moving) joystick! 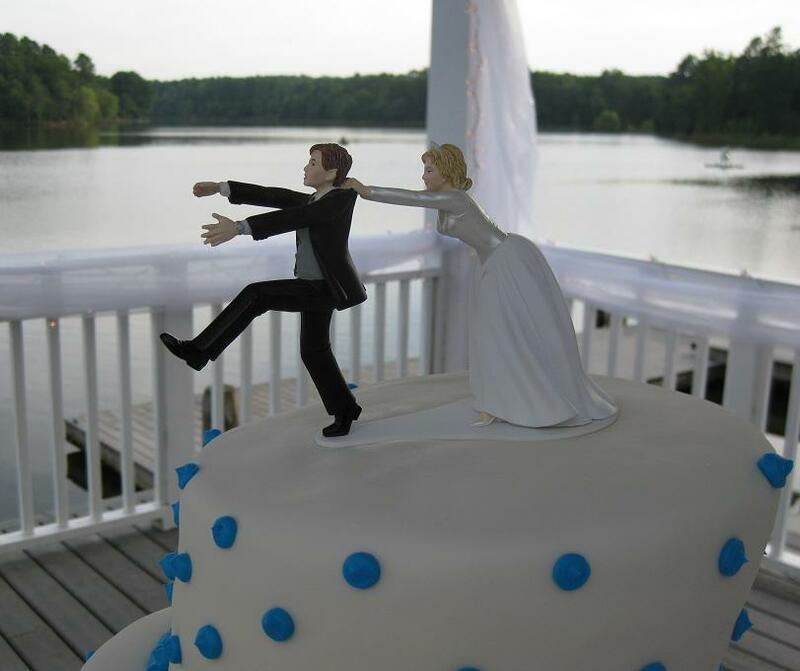 See Our Grooms cakes here!